You Can Now Add Pages to Your Blogger Blog! Have questions about blogging? Join the BlogCoach Community, where more than 300 bloggers are willing to answer them. Today we're critiquing the blog Health Food Lover. Blogger Michelle posts healthy recipes as well as occasional giveaways. 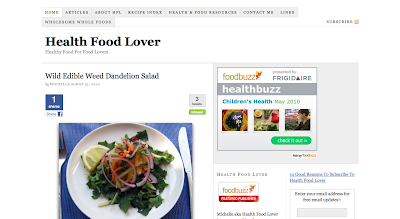 Recent posts include "Wild Edible Weed Dandelion Salad," a "Wholesome Whole Foods" blog carnival, and "Wild Edible Walk and Talk with Sergei Boutenko." Does my sidebar look too busy? Too many adds etc? I want to use my blog when I finish my course (Naturopathy) so I want to keep it professional but I still want it to show my personality. Is there a way to meet in between the two in terms of blog design and the tone in my posts? I'm thinking of making my footer much larger to include a list of my pages, copyright, disclaimer etc. Would this be a good idea? How can I improve my posts? Is my site easy to navigate and to get what it's about? How I can improve my design? How I can increase my readership and subscribers? How can I connect to my readers more? Readers, take a look at Michelle's blog. do you have any tips for Michelle? Do you blog on Blogger? If so, go make a full backup of your blog posts NOW and then come back and read this. If you're a "deal blogger" or "frugal blogger", and you like blogging, you need to move your blog. Now. Blogger has an ineffective system for finding and removing spam blogs, and bloggers are suffering as a result. It's not just deal bloggers, either. Visit Blogger's help desk and you'll see post after post after post from bloggers of all sorts with the same issue. What's happening? Blogger's spam-seeking bots spider its blogs looking for offenders. Blogger doesn't give any specifics about how the bots "find" them, but my theory is that it looks for words that turn up commonly in spam blogs--words like "free" and "sale" and "cheap". Another theory is that Blogger's bots look for blogs by the same user which link to each other. When the bots find a potential spam blog, the blog is locked or, as seems to be more common lately, deleted without a human ever reviewing the blog to see if the bot's judgment is accurate. 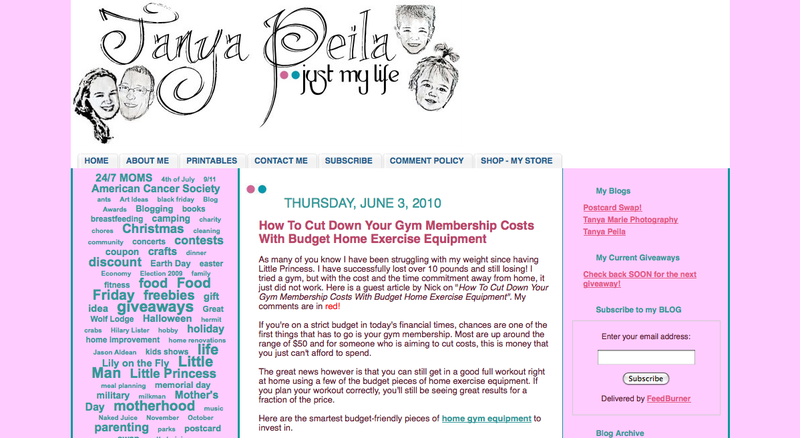 Baby Cheapskate, Freebies4Mom, All Aboard Deals and way too many other read-worthy blogs have disappeared in an instant. Can it happen to you? Sure it can, especially if you use words like "free" and "sale" a lot in your blog. And don't think you're immune just because it's already happened to you once. This isn't chicken pox or mono. My blog was locked once before for the same reason, too. Evidently there's no system in place to exempt blogs that have been reviewed and exonerated from Blogger's spam seekers. You need to move your blog away from Blogger. Now. If you DO wake up one morning to find your blog deleted, don't panic. Your information isn't gone. Unless Blogger decides your blog IS a spam blog. (And if it is, you're probably not reading this.) If you've published thousands of posts, your backup file may be too large to be usable, I'm sorry to say. But still, don't panic. The first step to recovering your blog is to file and appeal and a request for a review (by a human). These are two separate things. Once your blog is restored (for me it took four days), your posts can be transferred to your new blog if your backup file didn't work. In the meantime, buy a domain name (hopefully you already have one) and open a hosting account. Find yourself a blog designer to take care of setting up your new blog and transferring posts to WordPress. I paid $300 to have it done, and it took two days (email me if you want a referral). You can do it yourself, of course, but if your blog has just been deleted, your probably a bit stressed out and might not want to deal with the steep learning curve. Let your readers know what happened via Twitter and Facebook and tell them that you'll be up and running again soon. Your readers will stick with you, I promise. 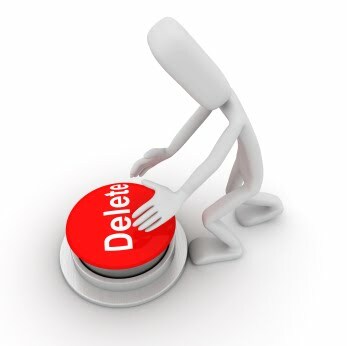 Of course, if you go ahead and move your blog before it's deleted, the process will be MUCH easier. Blogger has a big problem, and they don't seem close to solving it. It's really a shame. If you have any questions, I'm happy to try to help or point you to someone who can. Leave a comment or email me. Check in at BlogCoach.org tomorrow for a brand-new blog critique! 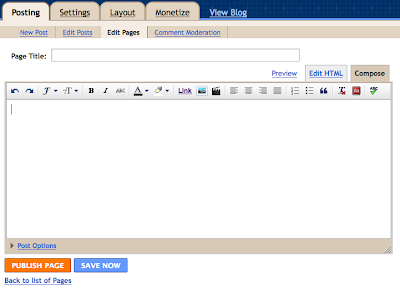 Hey Blogger users: Blogger has finally added much needed functionality to Blogger Blogs--pages! Enter your title and page content, and then publish. A handy widget allows you to add links to your pages to your sidebar or to the top of the blog, navbar style. You'll find a list of your pages at the Edit Pages tab, along with the options to edit, delete, or view them. If you're using a custom template, you may need to fiddle with your html a bit. You'll find instructions for doing so here. Well I know what I'll be doing this afternoon! What pages will you be adding to your Blogger blog? More info on creating pages in Blogger.